What can make an art lover from Colorado leave her dreamy life in the idyllic mountains of Vale for the hustle and bustle of life in the Big Apple? Love, that's what. And the Metropolitan Museum of Art. Twenty six years ago, Kaaren Schilke-Cherns followed her new husband, Trishul, to his home in New York City and has been sinking her artistic and culinary roots deep into this cultural melting pot ever since. With its ethnic markets, fabulous art galleries and architectural gems it has become a place she truly calls home. These days, when her husband asks if she feels happy with her life as a New Yorker, she says, "Entirely." Kaaren's love for art and food is evident in all her photos. 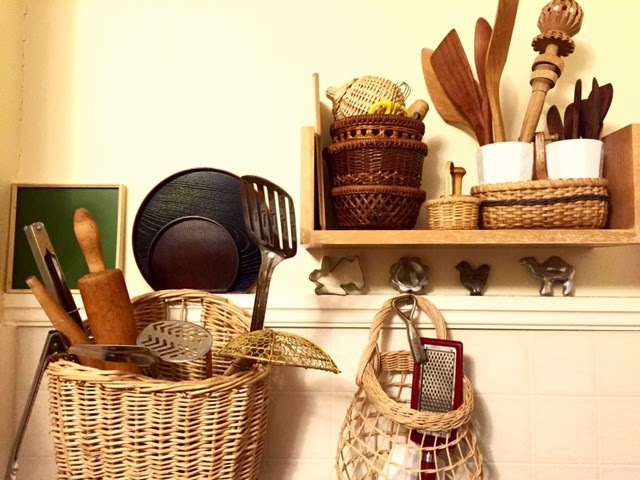 Her home in Queens, as well as a country home in upstate New York, have become a veritable treasure trove of antique and vintage dishes she has accumulated through the scouring of thrift stores, craft fairs and boutiques. 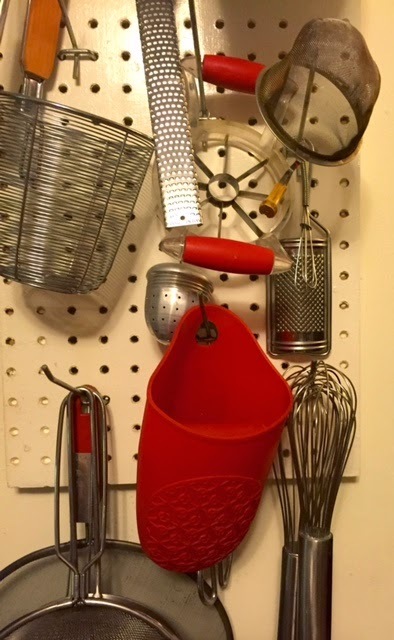 These are used, both in everyday life as well as on special occasions, to provide a beautiful backdrop for the colorful array of food she cooks regularly, drawing from recipes of her Finnish heritage, as well as the rich variations of cuisines that surround her. She is constantly exploring Manhattan's Japanese, Korean and Italian markets, and in Queens she visits the large grocery stores in Jackson Heights for Indian specialties and frequents Elmhurst for an abundant array of Chinese produce. In the summer, her meals are inspired by the local produce from farmer's markets in upstate New York where tomatoes, corn, squash and beans make their appearance, with apple orchards and blueberry farms close by for dessert creations. Kaaren with Pear Flognarde, a creation from the cookbook "A Kitchen in France"
I started my study at the Urasenke Chanoyu Center shortly after that introduction. In the years I have studied (I'm about to get the highest diploma a student can receive this year) I have learned how to perform the intricate movement that is the tea ceremony. 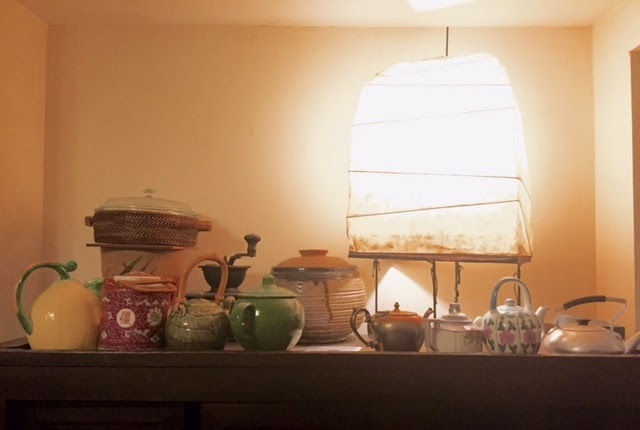 I've also learned the history of the tea ceremony and an appreciation for the arts that surround it: ceramics, lacquer arts, flower arrangement, and Kaiseki, the artful arrangement of food preparation to accompany the tea. It has informed my taste in fabrics, furniture, food and appreciation of the seasons. Most importantly, I've learned to embrace the Japanese aesthetic of Wabi Sabi: the perfection of the imperfect." Meringues with warm strawberry compote and whipped cream. 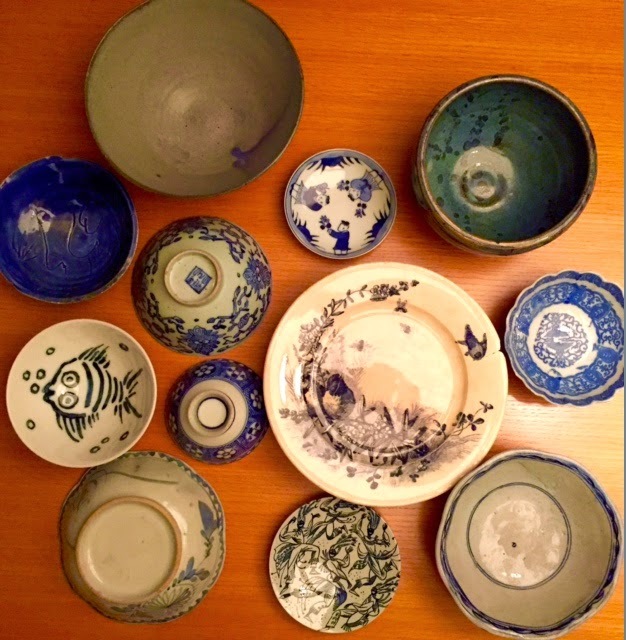 Blue and white ceramics of many cultures and periods, from 19th century Chinese bowls and early 20th century Japanese rice bowls to mid-century Danish plates and collections from local artists. A collection of teapots and ceramics await the art of afternoon tea. Also pictured is a vintage Akari lamp by Japanese artist Isamu Noguchi. The "water room" inside a wooden Japanese chest which holds some of Kaaren's tea ceremony bowls along with a couple of matcha tea whisks. 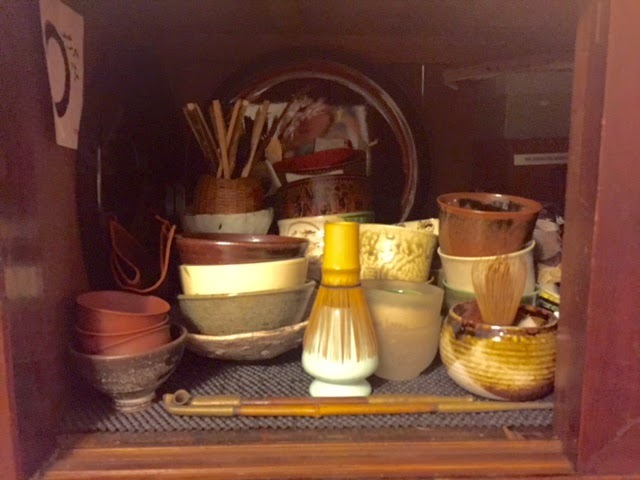 Note the two Japanese tobacco pipes in the foreground. Chili Verde, homemade tortillas and honey roasted carrots with cumin. We're coming for dinner, Kaaren! Fresh curry leaves, coriander seeds, cumin seeds and black mustard seeds. With cookbook author, Mimi Thorrison, at Club Monaco in New York City. Also pictured, Kaaren's beloved Jack Russell Terrior, Dart. Galette des Rois and Meyer lemon granita for dessert on an 18th century Chinese plate. This is a soup that has one foot in the cold of Spring & the other in the Northern Summers of Scandinavia. I've always used the classic ingredients of potatoes, cauliflower, green beans, carrots & peas, but have enjoyed it with corn, fennel, asparagus & artichoke hearts. You can fatten it up or slim it down by either using full fat milk & 1/2 & 1/2, or skim milk with a dot of butter for richness. Any way you make it, delicious! Start a pot of salted water to boil that is large enough for your 3 cups of potatoes. Let them simmer 10 to 12 minutes cooking them until almost tender, but not falling apart. Set aside to cool. In the meantime heat a soup pot over moderate heat, add 1 T of butter & 1 of olive oil, cook your onions & or shallots until soft. Then add milk, 2 cups of potatoes, cauliflower, carrots, salt & a few good grinds of pepper to pot. Simmer for around 10 minutes until veggies are firm but tender. While the veggies are simmering use some of the potato water & the remaining 1 cup of cooked potatoes to blend until creamy & smooth in the blender. Add to the soup pot to thicken the milky broth. Just before serving add the green beans, peas, dill & green onions cooking for a couple of minutes. If you have opted for the skinnier version without the 1/2 & 1/2 this is the time to add the 1 tablespoon of the extra butter for a bit of richness. A dollop of sour cream or yogurt in bowl if desired. It is important to keep this soup crisp & clean; don't overcook your peas & green beans. You want a fresh bite of summer in a bowl. 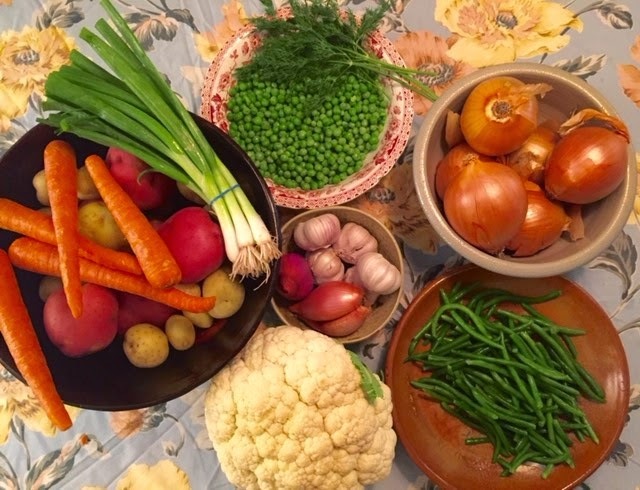 Vegetables sourced from local markets and ethnic grocery stores are a key ingredient in Kaaren's soups. Another fresh tasting Spring soup for you to enjoy. Heat butter in a large saucepan, add onions & shallots. Cook for 5-10 minutes over medium low heat until the onions are clear & tender. Add stock & bring to boil. Add fresh peas & cook for 3-4 minutes ( frozen peas will only take 3 minutes.) Remove from heat & stir in the mint, basil, salt & pepper. Pureé soup in batches by placing 1 cup at a time in the blender & running it on a low speed with the vent hole open to let out the hot steam. Keep adding more to the blender 1 cup at a time until it is 1/2 to 3/4 full. Pour out into a large bowl & repeat until all the soup is pureéd. Whisk in the creme fraiche or sour cream if you desire & sprinkle with the fresh chives. Enjoy either hot or cold. All photos by Kaaren Schilke-Cherns and used with permission. 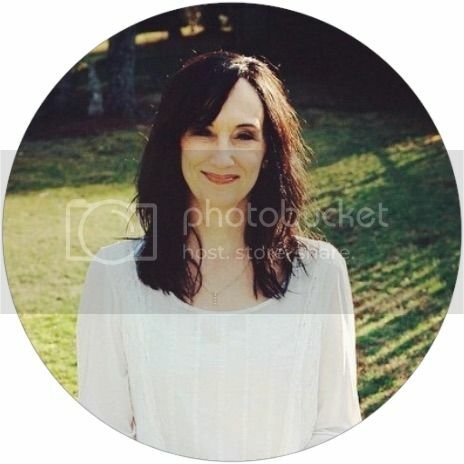 Truly a treat an an honor to be featured on your blog Naomi. Many thanks! The pleasure was all mine! You are lovely and so is your home and your cooking! Thank you, Ms. JoAnn! It was a pleasure! Ms. Katherine: You are a sister to the lovely Kaaren? She was such fun to highlight on my blog. Thanks for your comment! Such a complement Kat! Glad you liked the pics & post. I sent the link to my 2 foodie pals here in Santa Fe and both were very impressed with the post and loved the pics .. Elizabeth gave me Mimi's cookbook for my birthday. I have yet to brave any of the BAKING recipes as I am not really very good a BAKING ... Plus I have been so busy in the studio with the Indigos I am working with and my handbags. A pre made salad from TJ is about all I can muster out of the kitchen. Thanks for sharing the post, Ms. Katherine. I appreciate it! !